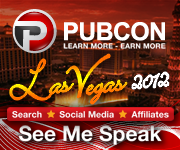 I’ve been asked to moderate a session at Pubcon and also speak at the Effective Search and Display Advertising Campaigns session. Kerstin and David are among the best in the business so and it’s quite an honor to be on a panel with them. There was a lot of good stuff in last year’s session, and I’m sure there will be even more this time. Come see us!